a hypothetical battle set in the South. 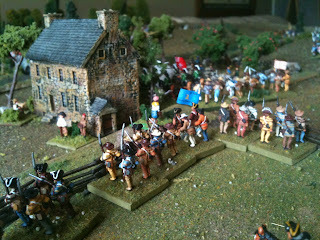 The British have a smaller, but better force (as usual!) 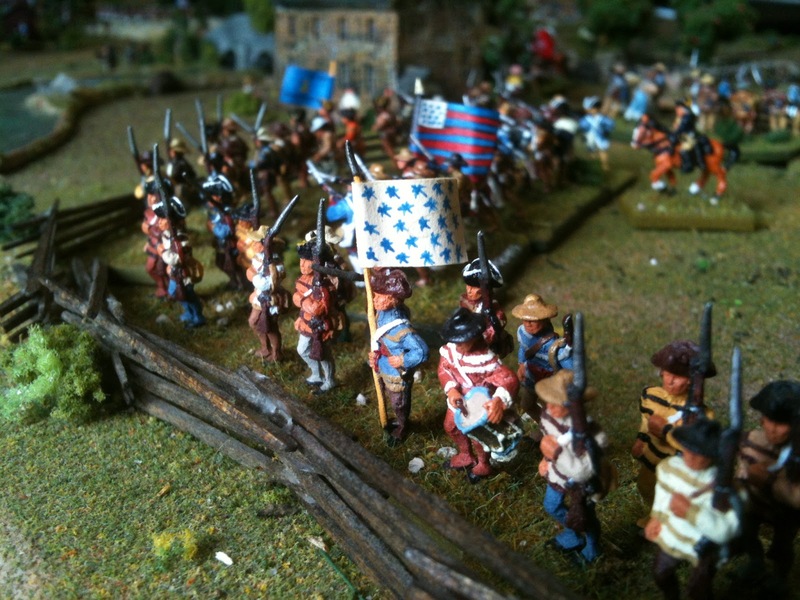 and the Continentals have a larger amount of mixed troops. 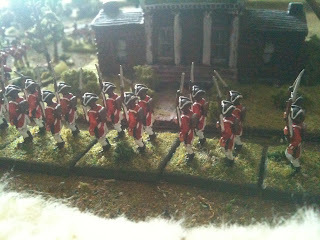 The British objective is to cross the river and destroy the Continental army. They can get some additonal victory points by capturing the town and/or Continental supply wagons & camp. 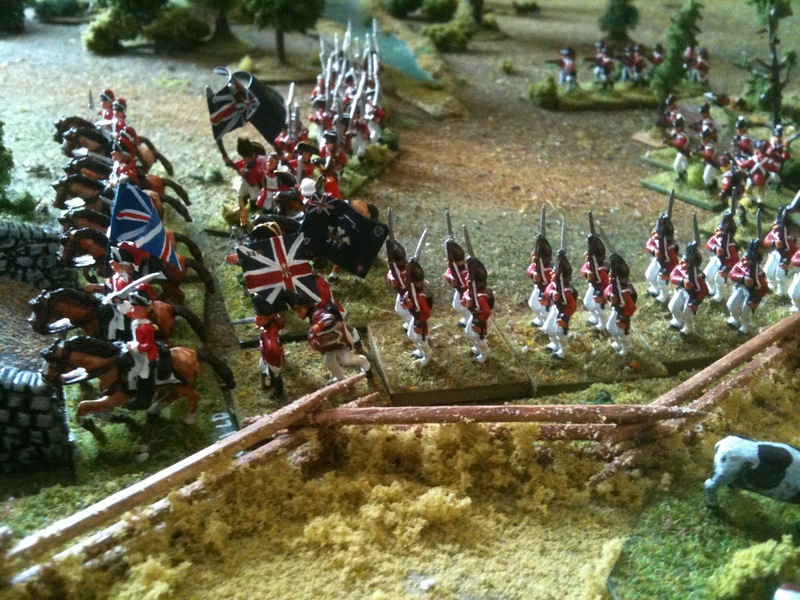 The British have been told that there might be a ford down river from the bridge. 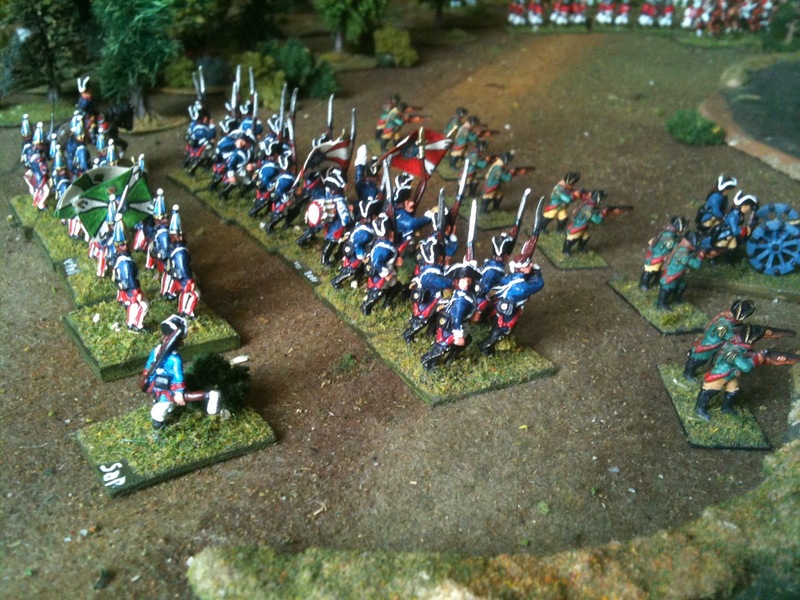 The Continental's must keep their army intact and repulse the British offensive. 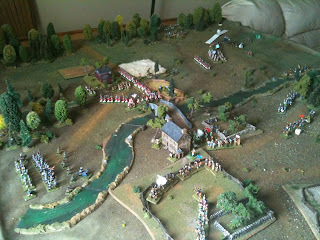 militia on the hill to the top right (across the river) and are trying to defend the ford. I use a cloth mat with foam hills underneath. The British advance! This is the 23rd Regt. of Foot - Royal Welsh Fusiliers. These are Polly Oliver figures. They are my favorite 15mm AWI figures, but they are very slim and suffer from a lot of broken bayonets, swords, etc. 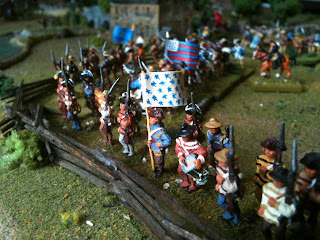 Jaegers, Old Glory "von Bose" line infantry and Polly Oliver "von Rall" grenadiers. 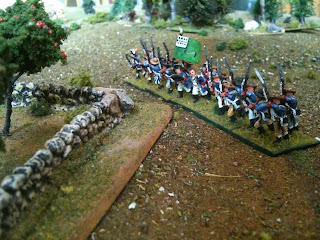 The 5th New Jersey advances to secure an apple orchard. Old Glory 15mm AWI. by the Hessian light artillery piece, and forced to retreat. 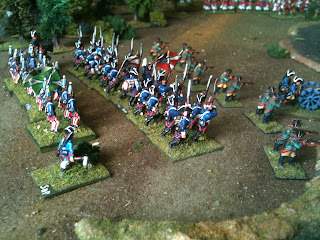 did not deploy well and was soundly thrashed by the British commander in the game. 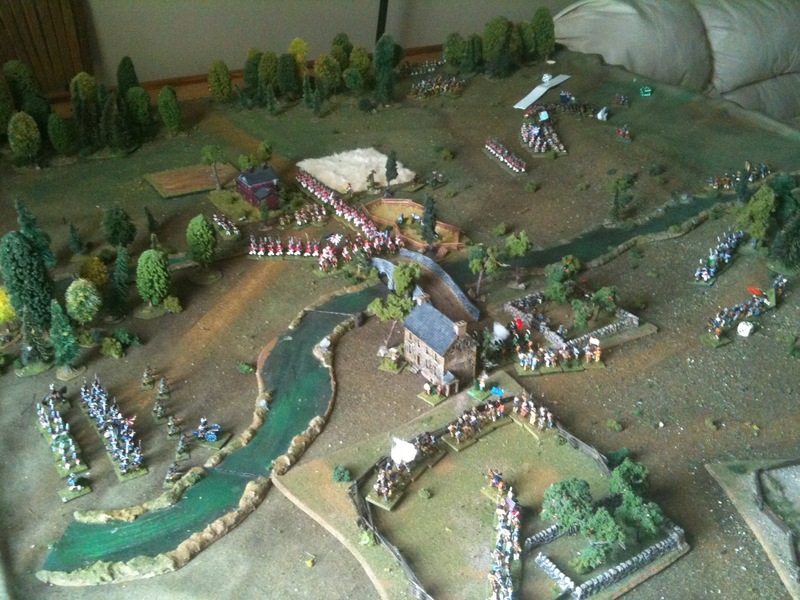 He had troops deployed on both sides of the river, and had his artliiry and best troops deployed so that they never really got into the fight until it was too late. An American heavy artillery piece. 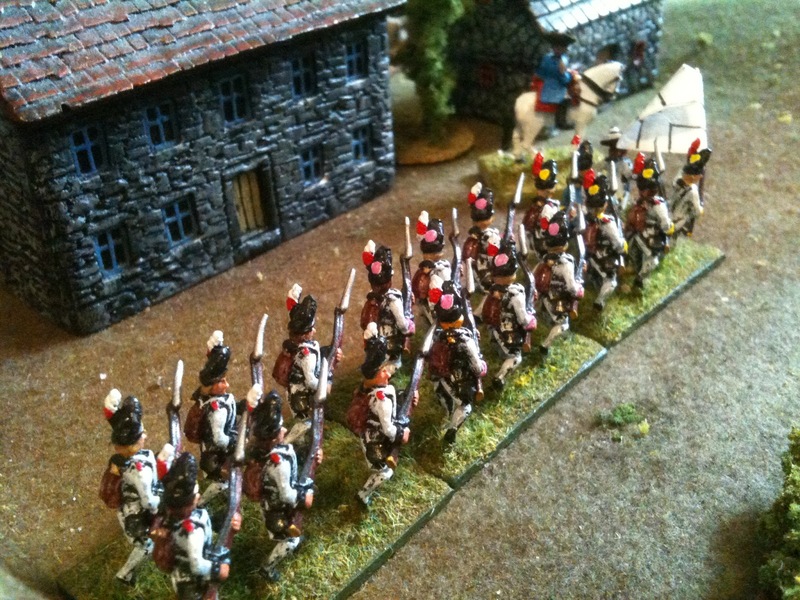 15mm Frontier figures. The 33rd Foot advance past a plantation. Some great looking figures, you've got there and a nice batrep too!!! Really nice looking game and report! What a wonderful looking game. 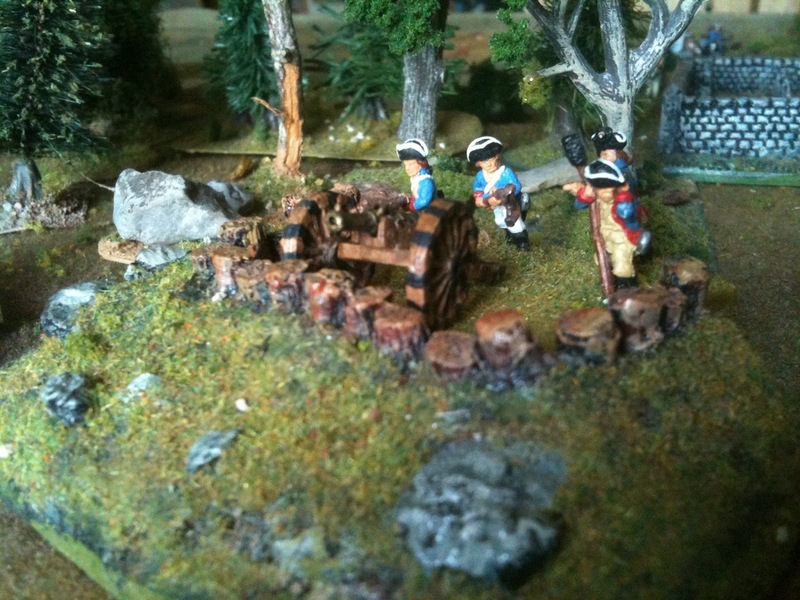 Excellent terrain and figures too. Thank you for sharing.